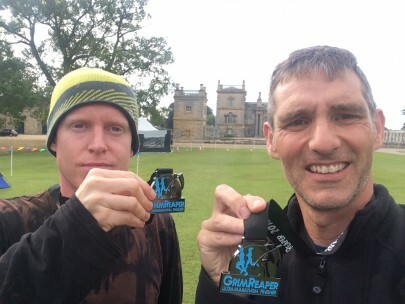 Before the Grim Reaper Ultra 2015, Richard and I had previously only run two ultra distance races. Last year we ran the Longman Ultra, a 33 mile race along the South Downs Way, and the Brecon Beacons Ultra, 46 miles over the famous Welsh hills. Why we thought this qualified us to take on 70 miles is anybody’s guess. Still here we were driving up the M11 to Lincolnshire to run 7 laps of the Grimsthorpe Castle estate. Seven laps that between us would spell despair, desperation, defiance in the face of defeat and ultimately conquering glory the like of which neither of us has ever seen before. I may be overstating the the drama of the situation somewhat, but spare us this savoury moment will you? Things did not start out terribly well. The journey up wasn’t too bad. However, after we arrived and were exploring the site, I looked over a fence in to a field and was electrocuted….which was a shock I can tell you. Camping on site cost us twice what we expected as it was £15 per person, not per tent. Then we visited about 4 restaurants in the local village before we found one which actually served food after 9pm. Finally after setting up our tent and getting everything organised for the morning, we had an absolutely freezing and therefore virtually sleep-free night. I don’t know why it was so cold on the last day of July, but it really was. 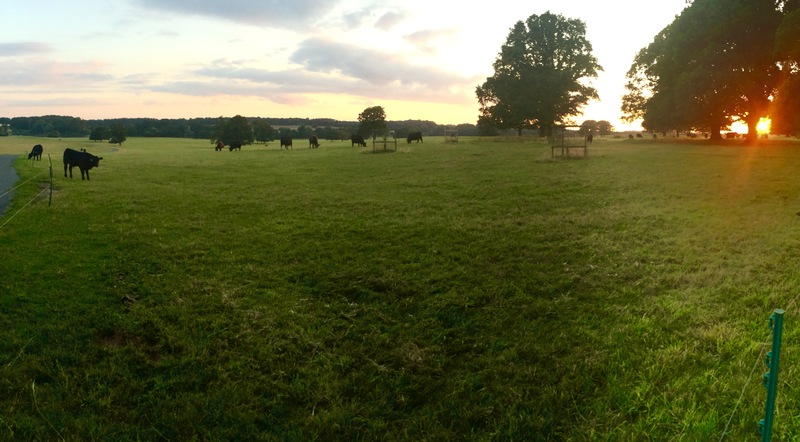 All that said, the Grim Reaper Ultra 2015 venue was beautiful. A lovely stately home in gorgeous grounds and, once we got over the cold of the night, framed in clear blue skies and bathed in sunshine. We were very excited. We collected our race numbers as soon as registration opened at 7:30am….we had been up since 5:30! 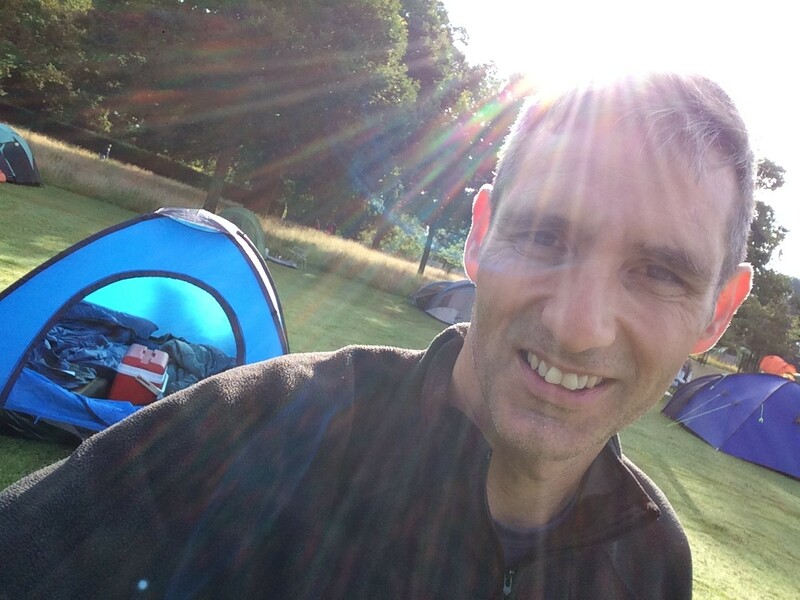 We ate our pre-purchased instant porridge and set our things out, some inside the tent and other items on a rug outside the tent for quick and easy access. As race time approached a number of other tents appeared on the green outside the castle. Plenty of runners arrived with diddy little day tents and I wished we had remembered to bring camping chairs as some had done. 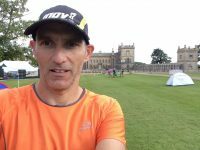 By 9:30 around 100 runners were gathered next to the castle facing down to a lake. Some were about to run 40 miles, some 70 and a few hardy souls were going to attempt 100 miles. That’s 10 laps round the estate, running all night. It was the most glorious day, although for running it was probably too hot. A blast on a hooter set us off down the gentle slope towards the lake and we were off on our first lap of the Grim Reaper Ultra 2015. Richard and I had chosen not to wear our race vests for the first lap. We figured we could manage without water or food for one lap at least. Which we did. 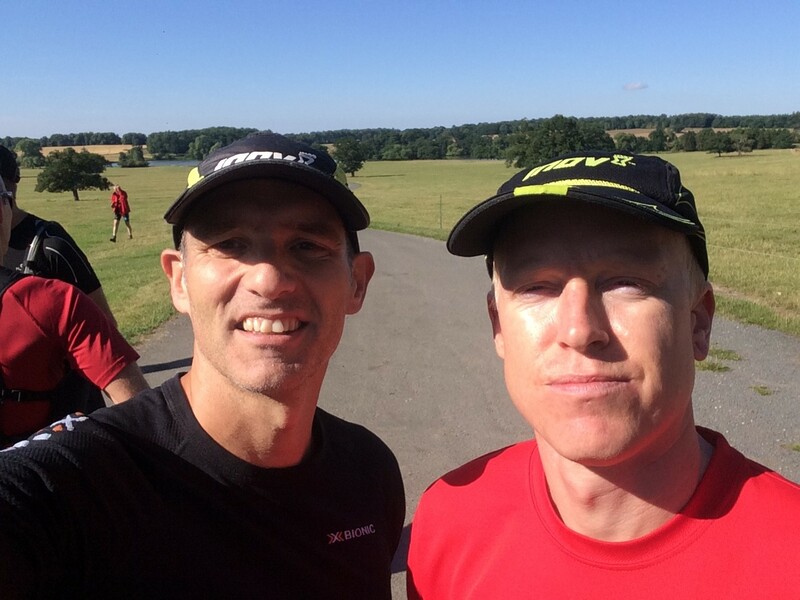 I remember us both thinking that the route was much prettier than we had expected and the first 10 miles skipped by in 1 hour 37 minutes. We decided that our plan should be to run each 10 mile loop in around 1 hour 40 minutes. With our hydration vests on and a change of hat for me, we set off on lap 2. The route was varied in terms of terrain. It was undulating but certainly not hilly. There was quite a lot of tarmac running but also grass, hard pack and limestone trails. We ran though forest and wooded areas as well as plenty of cornfields and along an old railway track. There were two checkpoints on the Grim Reaper Ultra course, neither of them manned or with any refreshments. They were merely there for us to check in at, confirming we had actually run the course. We each had a timing chip attached to our wrists and at each checkpoint we would touch the chip against a reader until it beeped. We also had to do this at the end of each full lap, at the main admin tent. Lap two ticked by in another 1 hour 40 and all seemed well. Twenty miles complete and both of us still running together. Things were about to change. We spent a little longer than perhaps we should back at our tent taking on fluids and changing clothes. I changed my shoes, which was a mistake. Then we headed out for lap 3. We were both saying that we didn’t expect to feel quite this exhausted so early in the race, but we continued on to the first checkpoint where we turned right on to the abandoned railway line. It was at this point I really began to feel the wall. I began to slow and Richard gradually crept away. The end of the railway section is the half way point of the loop. There is then a long straight road which leads back to the lake. It was here that Richard really flew off. I had nothing in the tank and by time I was half way back along the road, Richard was a dot in the distance. I struggled on to the second checkpoint and back to the castle where I sat for almost half an hour trying to recover. At this point I was seriously considering giving up. My Grim Reaper Ultra 2015 experience, over after 3 laps. I was not even half way through and I was totally shattered. I knew at some point I would feel like giving up, I just didn’t expect it to be so early in the race. However, after my long break, some fluids, a soaking in cold water and a change of clothes, I decided to carry on slowly. My best chance to complete the distance, I thought, would be to go very slowly and comfortably for the next few miles and see how things went. The other thing I did was to put Coke-a-Cola in my hydration vest bladder. This was to be my saviour. I walked the first mile or so of lap 4, down to the lake, round and up the incline. Once at the top I started running again very slowly. Gradually I got back in to the swing of things and the more Coke I drank, the better I felt. Back home in Worthing, my wife Victoria and Richard’s wife, Tanya, were watching the timing chip updates come in on the computer. Apparently I was in 5th position and Richard was 35 minutes ahead of me in 3rd place. I finished lap 4 and tried not to spend too long in the tent. 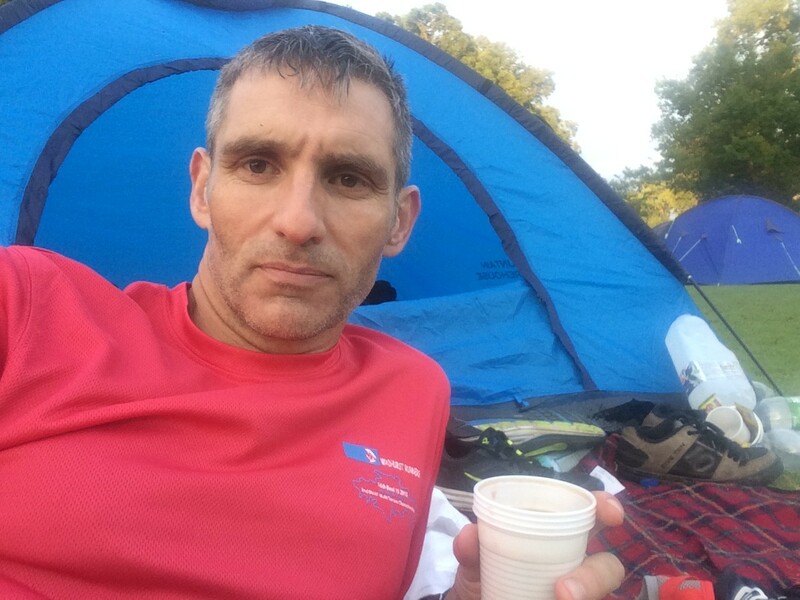 I was enjoying a cup of coffee supplied at the admin tent at the end of each lap and I was soaking myself in water too before changing my top and cap. I still walked most of the first mile of lap 5 before getting in to my stride. By now I was getting a little sick of the taste of Coke and I was watering it down. 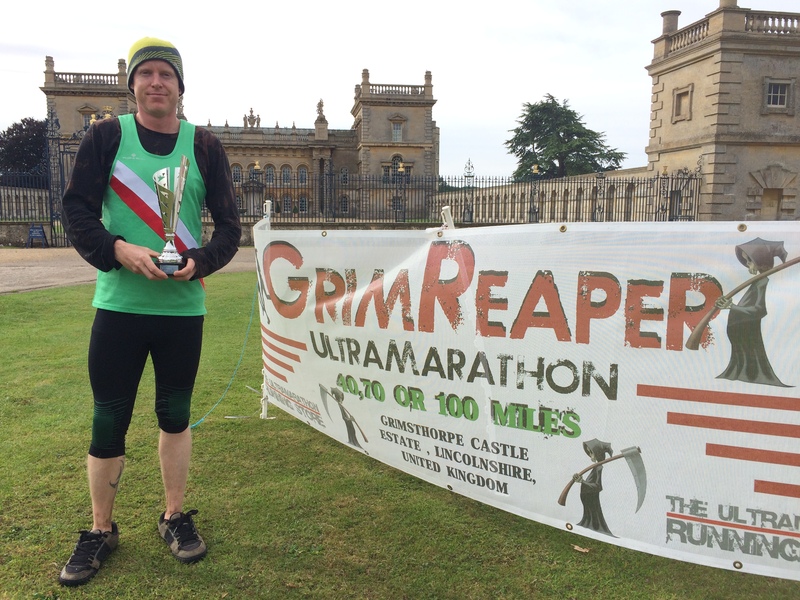 But my energy levels were good and I knew by now there was no way I wouldn’t finish the Grim Reaper Ultra 2015. At the end of the long road there is a left turn and a short section running right by the lake side. From about lap two I was so tempted to dive in the water! On lap 5 I ventured to the water’s edge and splashed the lake all over myself. It was heaven as the day was still very hot despite the approaching night. 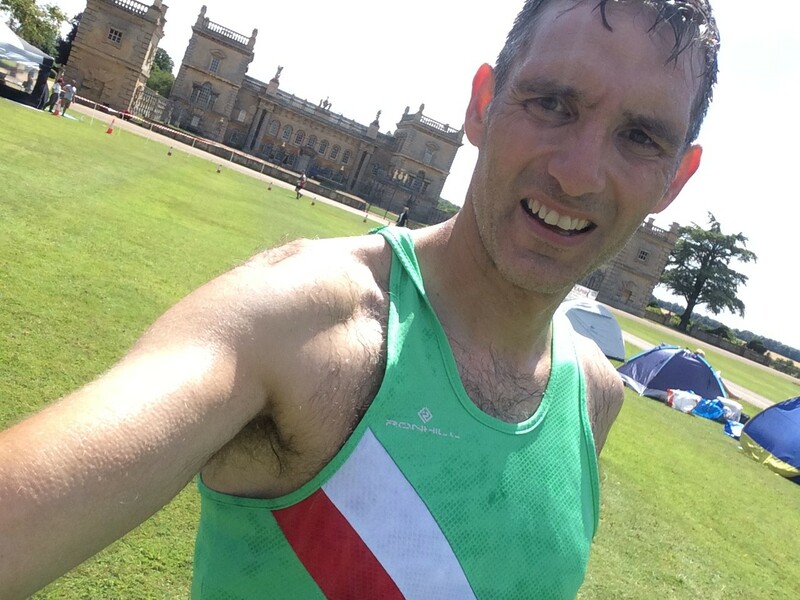 Fifty miles completed in 10 hours 27 minutes. My last three laps had been 2 hours each give or take a couple of minutes. I was still in 5th place and Richard still in 3rd. There was a point on the course where runners coming out on a new lap could meet runners coming in on the long road. On lap 6 I saw Richard on the way back. We shouted to each other that we were ok. I worked out he must be 50 minutes ahead. There was no way I was going to catch him, but I wanted to hold on to 5th and if I could catch anyone that would be a bonus. I forged ahead, but once I got back to the lake, I just couldn’t resist and stripped off very quickly to dive in the lake. I had a 30 second swim and it made me feel fantastic. I fair ripped up the final leg of lap 6 and completed the loop in 1 hour 55 minutes. By now it was dark and the last lap was very different to all the others. There was a hilarious moment in the tent just before heading out on the last lap. I had to change my shorts and underwear having been swimming. It was dark and the only light was my head torch. So as I was getting changed I was looking down to darkness all around apart from my illuminated crotch and the tent flap open. What it must have looked like for someone casually walking past the tent I don’t know! Having looked at the computer in the admin tent I had worked out that the 4th place runner was way ahead of me and the 6th place runner was way behind me. So my motivation dropped a little. Plus, it was quite eerie running all alone in the dark through the quiet forest. I stopped once or twice just to listen and to make sure I was still on the path. I passed one person on the railway line, but she still had another lap to go. I passed a couple of people on the long road, but they were doing the 100 mile race. So as I came up to the end I knew I was going to finish the Grim Reaper Ultra in 5th. What I wasn’t sure about was where Richard would finish. According to the computer Richard was in 1st place going in to the final lap. However, one of the staff told me there was a problem because there was a girl out on the course who hadn’t touched her timing chip at the end of a lap. They thought she was technically in first place despite what the computer was saying. When I got back, obviously both had finished and Richard had managed to pass her on the last lap. So he did win after all! He had pelted round the last lap as Tanya had texted him to tell him the lead runner was only 15 minutes ahead. He caught and passed her with 5 miles to go. Richard was the only 70 mile runner to finish in under 14 hours. I completed the course in 15 hours 15 minutes. I dread to think how much of that time was spent in the tent between laps! Still, if I had not used that time, perhaps I wouldn’t have finished at all. Richard was in the tent when I got back, brandishing a shiny trophy for his efforts. We celebrated with Pot Noodle before trying to get some sleep. Sleep, however, was almost impossible. 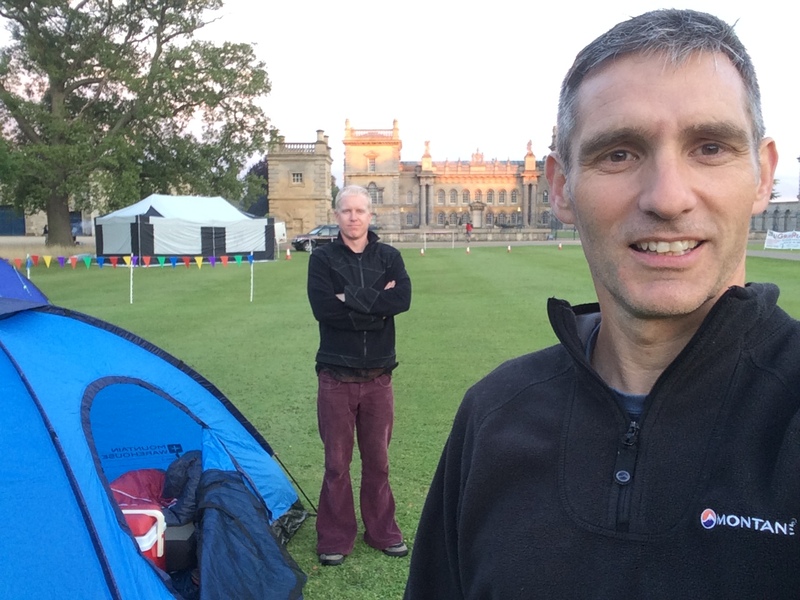 It was nowhere near as cold as the night before, but we were wired to the max and talked about the race for hours before drifting off in the early hours. We were wide awake again by 6am and we sat up to cheer in the odd runner still competing. According to the results the final 70 mile runner finished at 8:30am, some 23 hours of running. Of the 27 who started, 8 dropped out. There were also 27 runners who started the 100 mile race. Only 10 of them completed the entire course. There were 35 runners in the 40 mile race and three dropped out. We left the scene around 9am and had a huge full English breakfast at a diner on the way home. What a day, what a race. A thoroughly enjoyable weekend and a first race win for Richard. We have both agreed we wouldn’t want to do the 100 mile option though. Pretty as the course is, running that many laps through the night would be pretty demoralising I would have thought. I would rather run 100 miles over the South Downs or similar. Thank you to the organisers at Fat Feet and the volunteers for a great experience. Now we have run 70 miles, we truly are bonafide ultra runners.